The "war on drugs" launched by President Duterte in the Philippines "has sparked much debate. Nor do we know if the victims were all really involved in trafficking, but still can not afford such summary justice. " Through AsiaNews, the auxiliary bishop of the capital, Msgr. Broderick S. Pabillo, launches a call for national unity: "We need to be united against the drift that the government is taking". Manila (AsiaNews) - The shadow of the military dictatorship of Ferdinand Marcos' could return to envelop the Philippines. But the Church is watching to avoid this happening. However, unity and firmness are needed in denouncing the drift this government is taking", says the auxiliary bishop of Manila, Msgr. Broderick Soncuaco Pabillo, commenting to AsiaNews on the "slaughter" of alleged drug traffickers in the country. The victims of this war, launched by the new president Rodrigo Duterte from the outset of his election campaign, are now in the thousands. The perpetrators of these extra-judicial killings are the police or vigilante groups – who go unpunished – who are carrying out real raids againts the drug world. 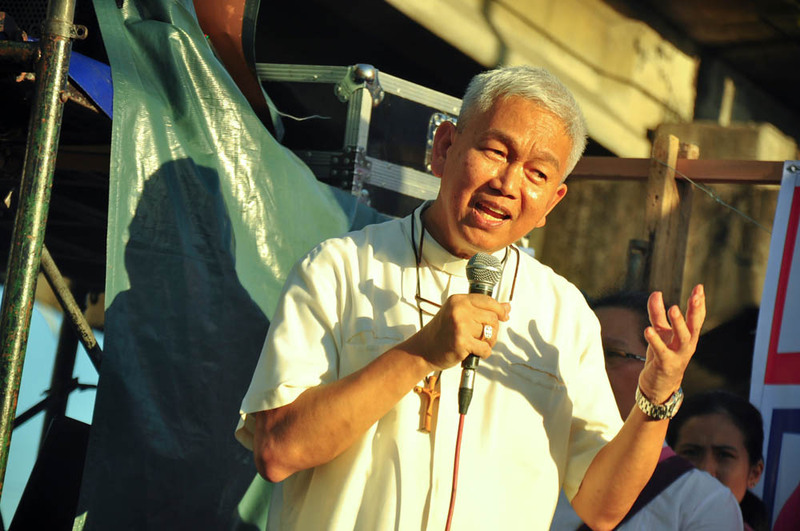 Human rights in the Philippines, says Msgr. Pabillo , "seem to have become a problem. By the way it is not clear whether these victims are really drug traffickers or are killed by the police for other reasons and in other areas. Is it true that there are also strong voices in the Church and in civil society who condemn these events: many have stood up to defend the civil rights of the population ". However these voices "do not seem to be loud enough: we need the help of everyone, including the international community, to ensure that those in power listen to what we have to say about the actions of our president." At the same time, the prelate adds, it is "even less reassuring to note another phenomenon: there are many other people, in public opinion and in the general population, who seem to agree with the actions of Duterte. They believe that his campaign is understandable and turn a blind eye on how it is implemented”. The war on drugs, reflects Msgr. Pabillo, "can not be the only focus of the current government. The new government was sworn in almost two months ago, and seems to have done nothing. It is clear that drug addiction and the drug trade are a huge problem for the Philippines, perhaps even the most serious. But you can not just focus on this problem". The Church's position on the matter "is very clear. We are against these killings, as we are opposed to the return of the death penalty in the nation. We are encouraging all Catholic groups to present its position, because there are important proposals and ideas to resolve the situation. We must, at the end of this trail, identify a 'common voice' which is that of the Church and the people it represents". During his election campaign of Duterte focused on the figure of the man in command, a "strong man" who according to his propaganda "is what the nation needs." His decision to bury the former dictator Ferdinand Marcos in the heroes' cemetery in Manila caused wide resentment among the survivors and the families of the victims of his purges. But also revealed a will other than democratic. According to Msgr. Pabillo "shadows of Marcos envelop the current situation of the Philippines. We do not even know if today the police are under the executive's control or if there is not rather a sort of 'shared control'. But the Church is watching and will ensure that those dark years do not return".